Across Dublin the statues are talking! 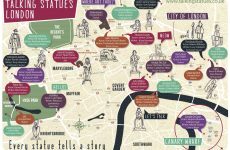 Working in partnership with Fáilte Ireland, we’ve animated 10 statues across the city. Go and have a natter with James Joyce (voiced by Gabriel Byrne) or the winged woman on the O’Connell Monument (voiced by Ruth Negga)! You’ve talked to statues…now, talk to walls! We’re excited to introduce Talking Statues’ upstanding cousins – Talking Walls Chester! 26 walls across this Roman city have been brought to life by the people of Chester, from pub landladies to penguin keepers – plus the voices of Gyles Brandreth, Lucy Meacock and Louise Minchin. 7 statues across Bedford are now talking! Hear from Matt Berry as John Bunyan, Al Murray as a 5-metre tall silver face, and more. Talking Statues: A voice for John Keats! Sitting on a bench at Guy’s Hospital, the statue of trainee-surgeon-turned-poet John Keats is silent no more – thanks to our MOUTHY competition winner Tom Jordan! Talking Statues comes to Leeds, in partnership with the Yorkshire Festival and West Yorkshire Playhouse! From the Drury Dames in City Square (voiced by Game of Thrones‘ Gemma Whelan) to the pétanque players in Bond Court (brought to life by Bard of Barnsley Ian McMillan), the statues of Leeds have found their voice. Talking Statues London: Thomas Coram talks! A new talking statue for Talking Statues London! By Bloomsbury’s Foundling Museum, the statue of Thomas Coram has started talking. The famous philanthropist is voiced with aplomb by the great Simon Russell Beale. 4 more Chicago statues have been given the gift of speech. Two and a half thousand Londoners joined Search Party – an unusual treasure hunt in search of…a secret party! Sing London has transformed Baker Street’s once bleak underpass into an intriguing Wonderpass! Part optical illusion, part underground gallery, the Wonderpass introduces a new kind of urban crossing. Statue Stories Chicago launched in August 2015. Writing workshops, competitions, and even a Macy’s window introduced Statue Stories to Chicago. To see who’s talking where click here. Ping! 2015 has finished, but you can always Play On! Visit www.pingengland.co.uk to find a table near you. Originally launching in 2014, Talking Statues London and Manchester have proved a huge success. Over 250,000 people have interacted with the likes of Hugh Bonneville as Isambard Kingdom Brunel and Simon Callow as Shakespeare. To see who’s talking where click here.